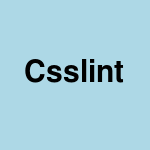 Csslint can be used to check the syntax of a css file. This can be used in release/deployment scripts to check the syntax of css before doing rsync/scp. Here are some useful csslint commands. csslint: No errors in correct.css. csslint: There are 2 problems in incorrect.css. Expected COLON at line 2, col 20.
csslint return shell status code 0 ($?) is everything is correct otherwise non 0 code. It can be used in deployment scripts to exit in case there is any css lint error. You can sleo set -e flag in bash which causes the script to exit whenever there is an error.